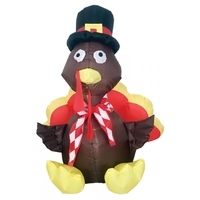 Your next Thanksgiving will be special with this Inflatable 4 ft turkey with scarf and hat! Great holiday yard decor! All these inflatable props are made of durable waterproof polyester material and glow with bright LED lights! They self-inflate in seconds, and deflate quickly for easy compact storage. Included adaptor plugs into any 110 outlet and has a 3 foot cord. Safety and operation instructions are included, along with 3 ground anchor stakes. For indoor and outdoor use.